Yesterday we published an interview with Alex Wang, CEO of Synology America, and as part of that interview we were able to get a sneak peak into some of the new NAS and Wi-Fi products that Synology is planning to launch through to the end of 2018. The company plans to introduce a follow-up to the RT2600ac released earlier this year. The new MR2200ac comes with mesh features. Similar to other mesh routers from the top tier vendors, the MR2200ac sports the Qualcomm IPQ4019 SoC with integrated dual-band Wi-Fi. The additional PCIe interface enables Synology to add a second 5 GHz radio, turning the MR2200ac into a tri-band router. Like the Netgear Orbi, the MR2200ac plans to use the second 5 GHz radio for backhaul purposes. 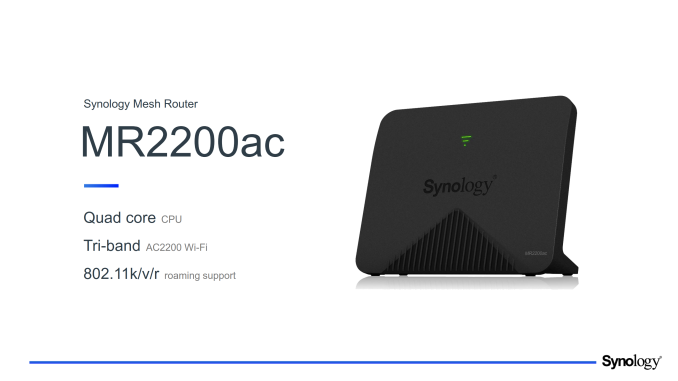 Synology has built up on Qualcomm's Wi-Fi SON features to enable the MR2200ac to mesh with the RT2600ac (also Qualcomm-based). The RT1900ac, unfortunately, will not be compatible for meshing purposes. Synology is planning to bring in features such as easy parental control and threat prevention (antivirus / malware scanning etc.) to make their routers stand out in the crowded market. In terms of subscription-based value additions for business users, Synology is launching Active Backup for Office 365 as part of their Active Backup suite. 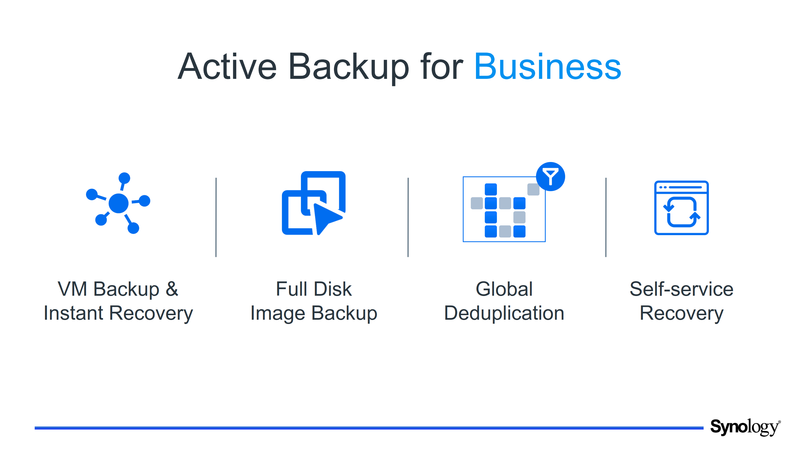 The Active Backup for Business service includes backup of virtual machines, instant recovery, full disk image backups with dedupe etc. 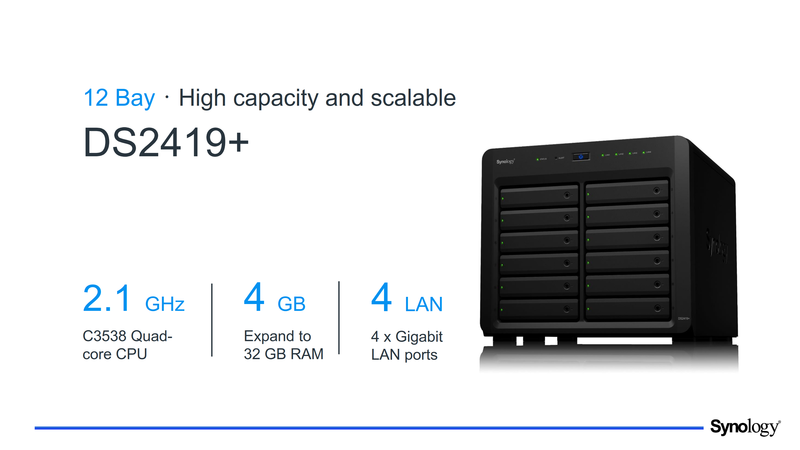 Being primarily focused on storage solutions, Synology will naturally offer several new NAS aimed at customers with different requirements later this year. In total there will be four new NAS products: two in a desktop form-factor and two in a rackmount form-factor. All four machines will support Synology’s typical NAS software with well-known capabilities. DS2419+ using the Intel C3538 Denverton processor and providing 12 bays in a desktop form factor. 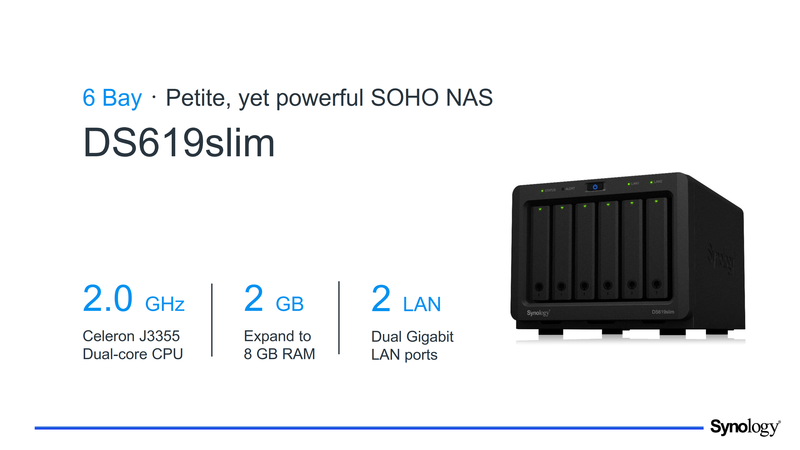 The most basic of Synology’s upcoming NAS devices is the DS619slim aimed at small office/home office markets. The DS619slim is based on Intel’s dual-core Celeron J3355 SoC (Apollo Lake) outfitted with 2 GB – 8 GB of RAM. The NAS has six 2.5-inch bays for HDDs or SSDs, but it does not look that it supports caching on an SSD for additional performance (at least today’s entry-level NAS products from Synology do not support this feature). Meanwhile, since RAID stripe mode will be supported, we are still talking about read/write performance of about ~500 MB/s even with hard drives. As for network connectivity, the DS619slim will have two GbE ports. A more powerful NAS that Synology will have later this year is the DS2419+. This NAS is powered by Intel’s quad-core Atom C3538 SoC (Denverton), is equipped with 4 – 32 GB of RAM as well as four GbE network connectors. The DS2419+ will have 12 bays and will support a PCIe slot for a caching M.2 SSD or a 10 GbE NIC. Moving on to rackmount NAS for businesses that require a higher performance and/or more storage space. First up is the 1U RS1619xs+ NAS based on Intel’s quad-core Xeon processor clocked at 2.2 GHz and equipped with 8 – 64 GB of DDR4 memory with ECC. This NAS has four bays and two M.2. SSD slots for high-performance caching drives. 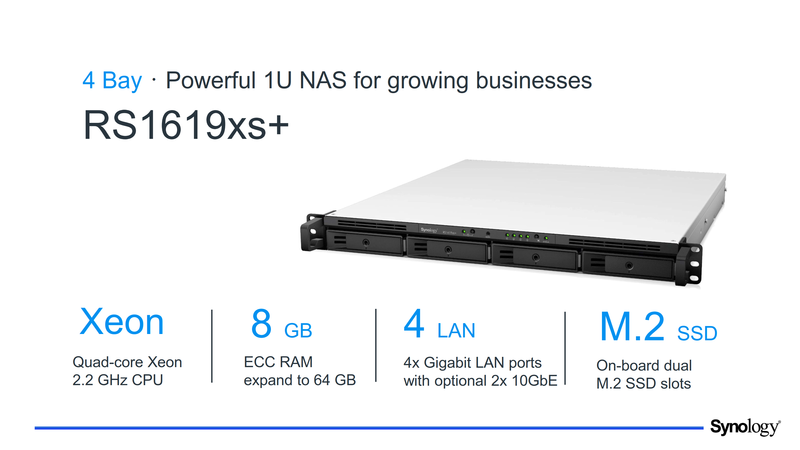 By default, the RS1619xs+ will be equipped with four GbE LAN ports, but optionally Synology may install two 10 GbE NICs for those who have appropriate networks. 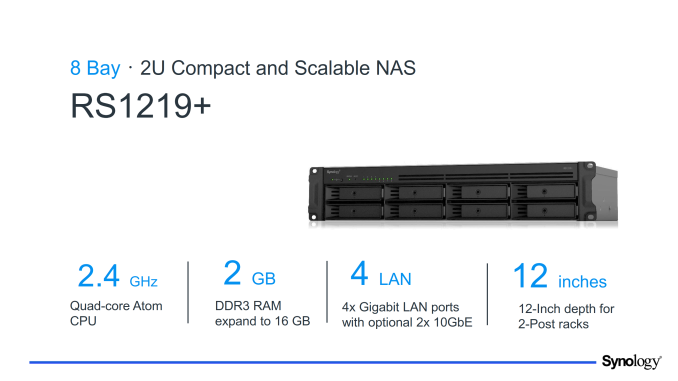 For customers who need a higher capacity, Synology will offer its 2U RS1219+ NAS featuring eight bays and powered by Intel’s quad-core Atom SoC and 2 – 16 GB of DDR3 memory. The machine will feature 4 GbE controllers by default or two optional 10 GbE ports for those who can use them. Pricing of the new NAS units will be announced when Synology starts to offer them commercially. (or 10GbE) 2 × M.2 NVMe SSDs ? "By default, the RS1619xs+ will be equipped with four GbE LAN ports"
We have an RT2600ac at work. While it is a solid and well performing wireless router, configuring for things like internal DNS and static DHCP is confusing, and does not work well in general. Tech support is essentially useless for this, too. I ended up having to return the RT2600ac because of those DNS/DHCP issues. Setting up a static IP address for my HTPC and NAS wouldn't stick and port forwarding wouldn't work properly either to allow my NAS and my PLEX server to reach outside the local network.